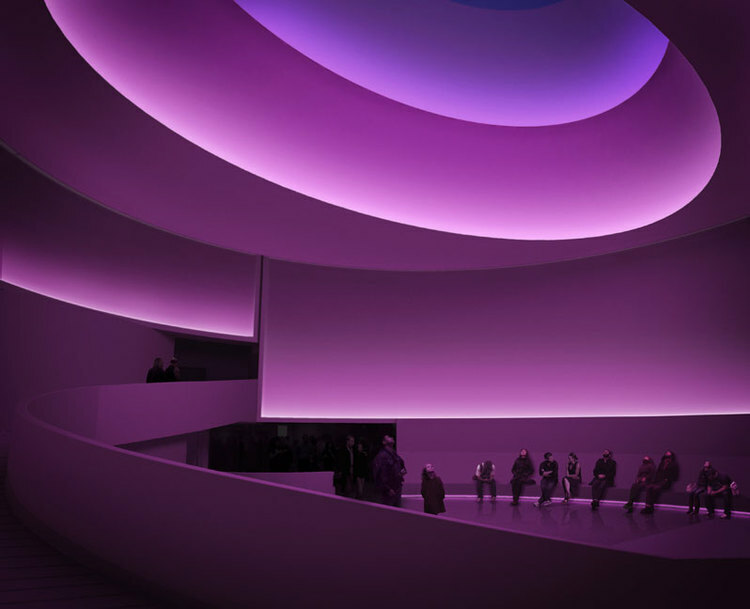 NEW YORK, NY From June 21 to September 25, 2013, the Guggenheim Museum presents James Turrell, the eminent American artist’s first solo exhibition in a New York museum since 1980. The exhibition features a major new site-specific work, Aten Reign (2013), which represents one of the most dramatic transformations of the museum ever conceived—reimagining the rotunda of Frank Lloyd Wright’s iconic building as one of Turrell’s luminous and immersive Skyspaces. Opening on the summer solstice, the installation will fill the museum’s central void with shifting natural and artificial light and intense, modulating color, creating a dynamic perceptual experience that exposes the materiality of light. Including select early works in addition to the monumental new installation, James Turrell considers the dominant themes explored by the artist for nearly fifty years, focusing on his investigations of perception, light, color, and space and the critical role of site-specificity in his practice. James Turrell is one of three concurrent, independently curated presentations of the artist’s work in summer 2013. Together, the exhibitions at the Solomon R. Guggenheim Museum, New York, the Museum of Fine Arts, Houston, and the Los Angeles County Museum of Art celebrate Turrell's groundbreaking career and form a three-part retrospective across the country. James Turrell is curated by Carmen Giménez, Stephen and Nan Swid Curator of Twentieth-Century Art, Solomon R. Guggenheim Museum, and Nat Trotman, Associate Curator, Solomon R. Guggenheim Museum.